Happy Friday, everyone! 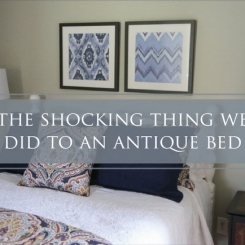 I’m really excited to share today’s before-and-afters of Allison’s home. The changes are pretty dramatic, as you will soon see. Do you remember where we started? 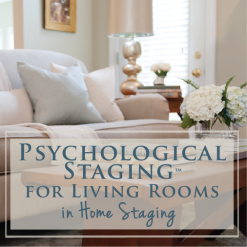 Following a rough emotional year for my assistant, Allison, she really wanted a whole new look for the home her family had lived in for almost twelve years. 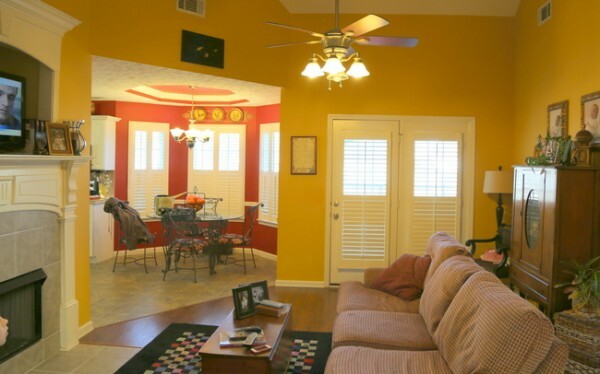 The home had a gold and red color scheme, which was quite popular in the 1990s. We traded out the oversized chair-and-a-half for a pair of more human-sized club chairs. We also decided to reorient the furniture, which works for a couple of reasons: it opens up the room, the face of the sofa draws you into the space from both the entry and the bedroom hallway, and the orientation of the sofa now hides the awkward diagonal break in flooring between the wood floors and the vinyl kitchen flooring. You’ll notice the fireplace tile is different. Before, it was dated and didn’t match the kitchen flooring. I suggested she have it painted (yes, painted – are you surprised?). That’s exactly what she did, and it turned out great. I’ll explain that process in an upcoming post. 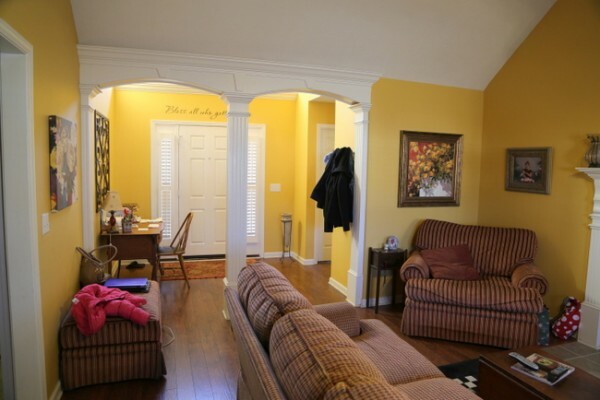 Here is a before view from the back of the living room, facing the entry. Now you can see how the new entry integrates with the living room, and how pretty Allison’s mother’s roll-top hutch looks in the space. 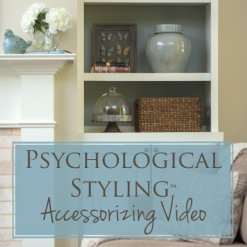 We brought in accessories in light to royal blue to keep the colors from being one-note. Varying shades of blues make the room more sophisticated and less matchy-matchy. 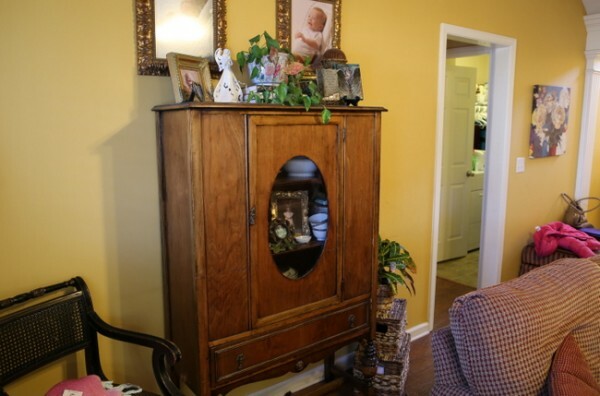 Before the makeover, this wood cabinet dominated this wall of the living room next to the bedroom hallway. I wanted to find a long credenza or dresser with storage below to better-utilize this wall space, and we eventually decided on this painted piece from Craigslist. 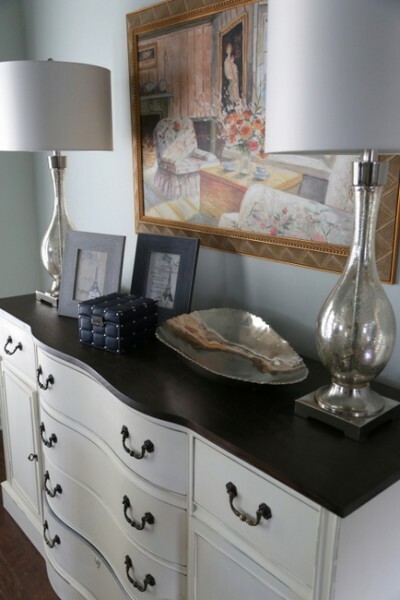 Topped with mercury glass lamps from HomeGoods and the art that formerly hung in Allison’s bedroom, it’s really perfect on this side of the room. The taller wood cabinet now sits on the other side of the room (you’ll see it in previous photographs above). 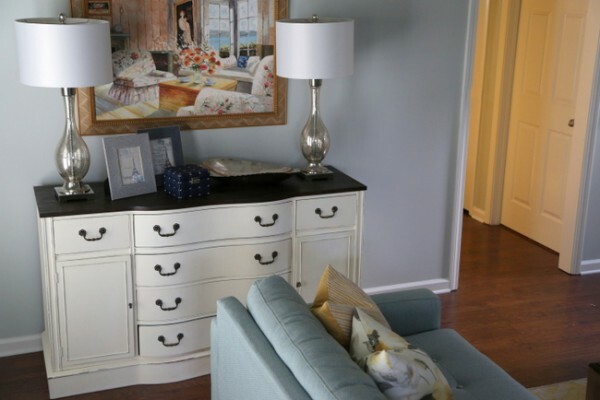 A credenza like this one is the one of the most versatile and functional pieces of furniture you can own. 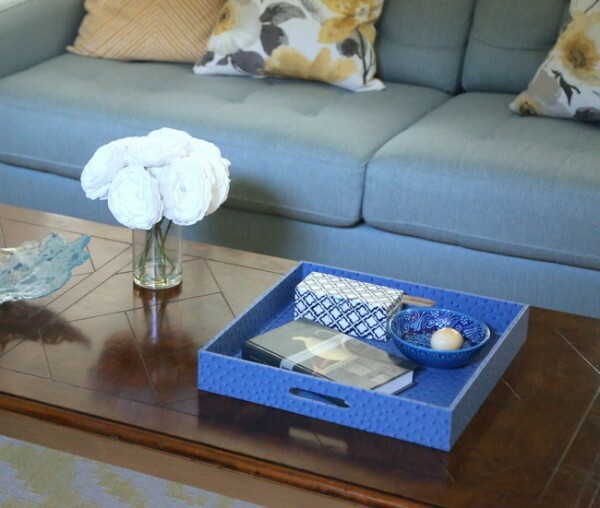 The small picture frames, dark blue leather box, and silver sculptural bowl are all from our HomeGoods run after we placed all the furniture. Now let’s take a look at the previous state of the kitchen. Red walls and ceiling, racing stripe tray, and high contrast. That contrast can really make a small space look smaller and just plain choppy. Your eye doesn’t even know where to go. 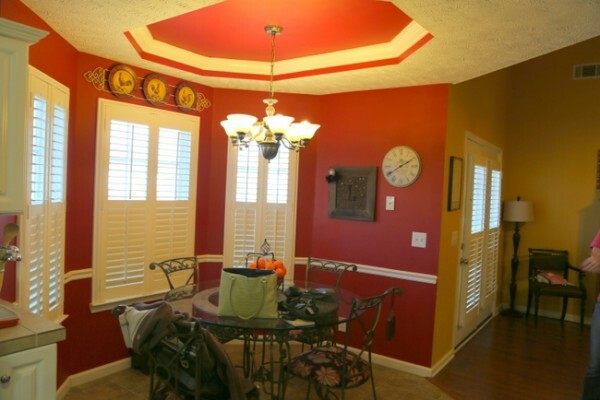 And look how many stripes there are, starting from the bottom: tan flooring, white baseboard, red wall, white chair rail, red wall, white ceiling, red tray stripe, white crown molding, red ceiling. Whew, I’m getting dizzy. 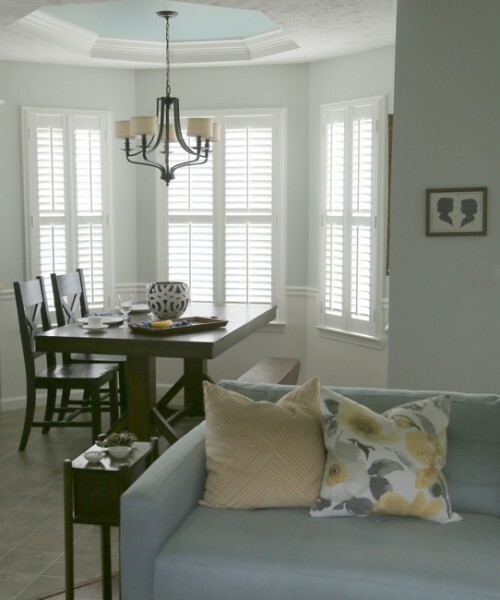 Because this is the only dining area for this family of four, Allison was ready to invest in something that would serve them better in this space. I suggested this dark wood trestle table from World Market, along with a couple of x-back chairs in black. Allison already had this rustic bench, which works as seating on the other side of the table. The new light fixture from Lowes is a reasonable upgrade, but the color of the walls and ceiling make the biggest difference, in my opinion. 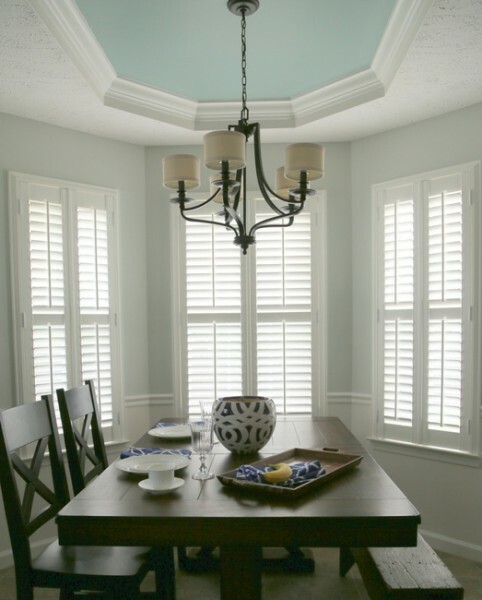 Now her beautiful plantation shutters look more architectural and high-end. See the view from the living room into the kitchen before. Lots of choppiness and disconnect. Notice the diagonal line on the floor where the flooring changes? Like I explained earlier, the sofa placement camouflages the awkward change in flooring and the whole transition is smoother and more cohesive. That color in the tray ceiling? Same color as the ceiling in the entry, so the whole space really flows together. This space had a lot of design challenges. 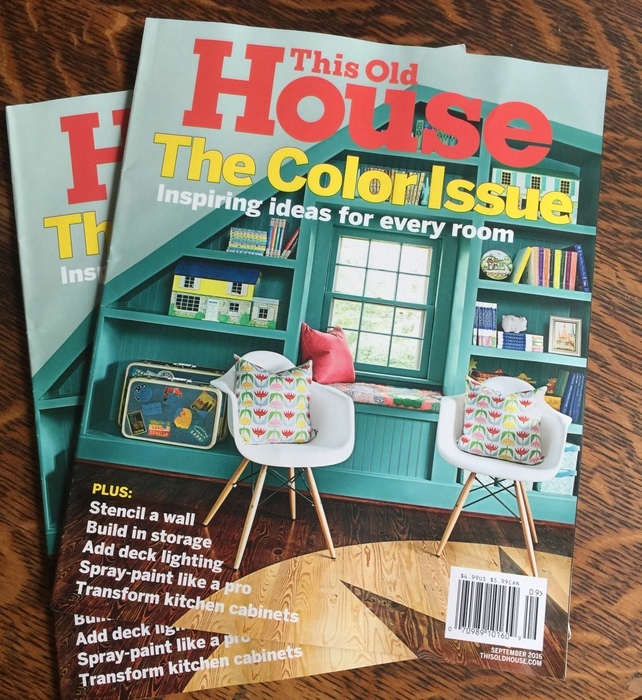 We’ve already discussed how we solved the challenge of the change in flooring and paint color flow in adjoining rooms, but there’s much more to cover. 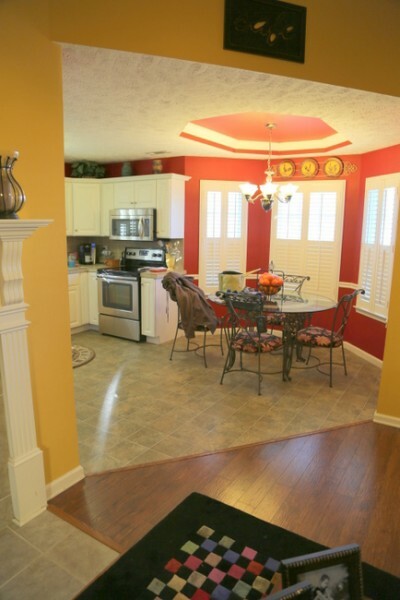 That includes the painted fireplace tile makeover, the painted melamine lower cabinets (who knew that could work?? ), the odd ceiling angles, the textured ceiling, and a few more surprises. 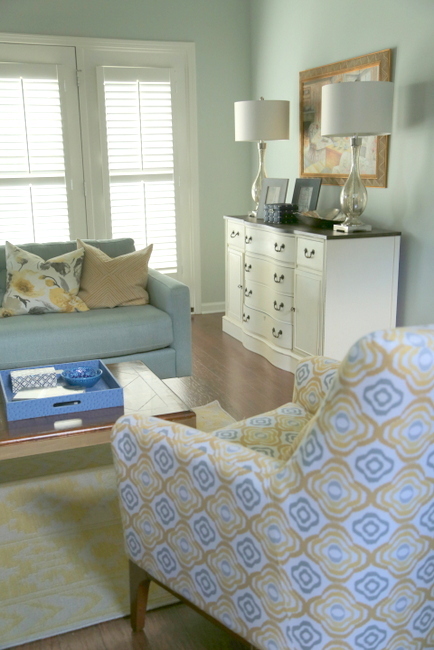 What’s your favorite thing about Allison’s home transformation? This entry was posted in Color Consultation, Design Intervention and tagged american-signature, before and after, blue rooms, budget-makeover, Designer Living Rooms, gray blue, HomeGoods, kitchens, living rooms, paint colors, painting-tile, painting-tray-ceilings, room makeover, the decorologist, west elm. Good grief! That looks amazing! I can’t stop looking at all of the details. Nice job, Kristie, and very happy for Allison and her family. If I had to pick a favorite, it would be the dining room transformation. So elegant! It flows so beautifully and the color palette is so pretty! I would love to see more of the kitchen cabinet area. As always, beautiful work! Wow! This looks amazing. I love everything you did. 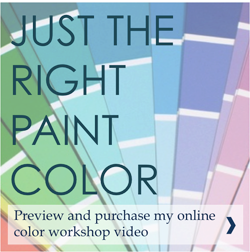 Do you mind sharing the name and make of the paint color? What a lovely makeover and fun to watch the progress.Love the soft and soothing colors.All so very refreshing to look at! Absolutely stunning. What a soothing color palette. I can’t really see it in the pictures, but I’m curious to know if you painted the vaulted ceilings the same wall color or did you use white? Also, I love the new furniture arrangement. It looks much better suited to conversation, but I wonder if it still works for them to watch TV? Can’t wait to see the kitchen! Good question, Eileen! With old tvs, it used to matter – the sofa had to face it directly or it might be hard to see. With the new technology of flat screens, it’s much easier to see even from the sides. They actually have more seating where they can watch tv from. Oh, and I’ll be talking more specificially about that vaulted ceiling, too (with pictures). Kristie I love what you have created and the credenza is perfect!! Wonderful it is so light and airy. Beautiful results! I love how you explain what you did and, more importantly, why. It helps sharpen my eye and appreciate your talent even more! Thanks! â€¦â€¦â€¦Wonderful job, Lady. 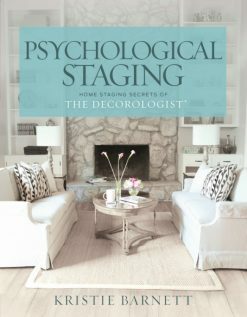 My decorator is doing the same for usâ€¦.it takes time to complete! Congrats!!! Time for a party gathering. I love metameristic colors like that – they are so much more interesting, aren’t they? Beautiful space! That credenza is exactly what I need. How do you find such treasures? Do you just constantly peruse Craig’s List? I just don’t have any luck when I search. I love, love, love your blog. Thanks for sharing your talent with us. At least we can look at your pics when we need serenity. It looks beautiful. I can’t wait to see more of the kitchen. Alison’s kitchen is very similar to mine. The great room opens to the kitchen and the dining area is the same shape ( with all the angles) it is almost like a octagone shape. I never lnow if the paint color in the two rooms shouldbe the same or different ss well as the Flooring. Can’t wait to see more. 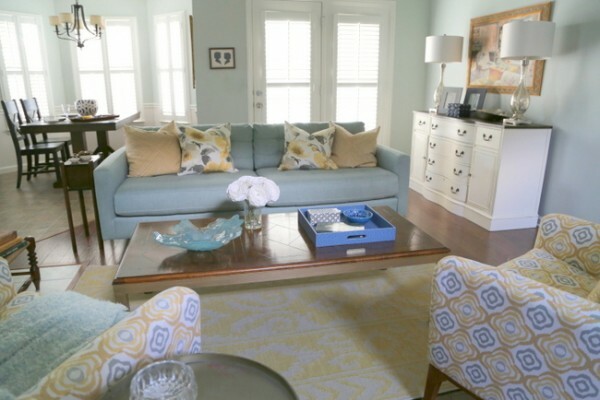 I love the colors, the way you moved the furniture around, and that new credenza from Craig’s List. What a transformation! 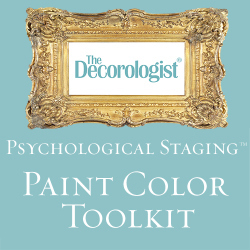 Isn’t it funny how we all loved those reds and golds on the walls so much but now it’s definitely time for a change. 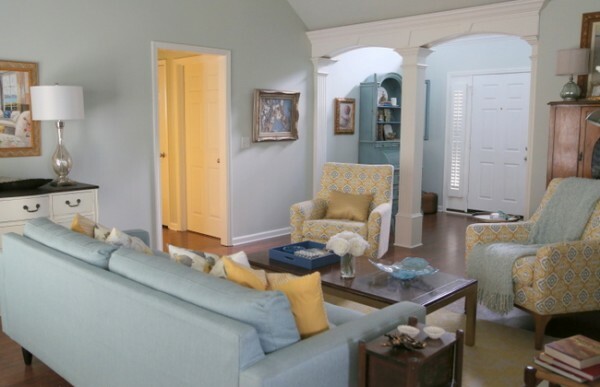 My favorite thing is the cohesiveness and calmness that the color scheme gives the rooms now. “WOW! What an amazing difference! I love the new paint colors, much more light, airy and peaceful than the dark red and yellow before. Hard to decide between the dining room and the entry way as to which is my favorite. I would LOVE to find a credenza just like the one you found on Craigslist! I need one in my dining/living room. 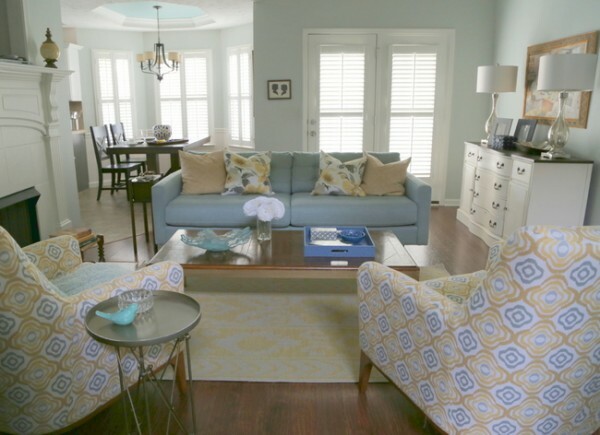 very restful, tranquil and stress-free – a great place to come home to. Curious what you would do for having guests over? 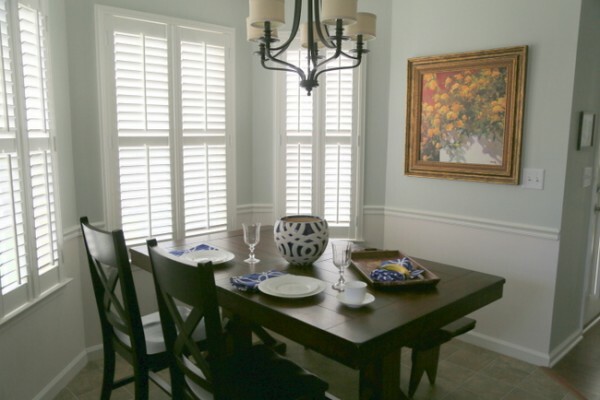 Seating area for dining room…. are there extra chairs when needed? There really isn’t a dining room in this small home. This is the breakfast area – before, it had a small iron and glass table with 4 chairs. Now it has 2 chairs and a bench – there is also an extra chair she is using elsewhere. The good news: the new table has a leaf to make the table bigger, and she can pull in folding chairs for extra guests. It’s just so inviting. I want to come in and have tea and talk. So pretty and well done. Thanks for showing us, too, that we can do smaller projects (bathroom) in a day/weekend by getting things from just one or two stores. For some of us, having lots of choices gets overwhelming and nothing gets done because we are paralyzed. Beautiful!~ Love the transformation using a few new pieces and a lot of creativity. Hope Allison and her family are loving it! Looks great! Wish I could get my home looking like that. I’ve started (with the help of your website and paint video) and am happy with the results so far, but it’s been a very slow process. So much to do, so little time… but I’ll get there (hopefully!). Looks fantastic! Love how you give us the details and do this with reasonable budget and time. If only you could do my house next! It looks glorious! I love the colors. it flows so beautifully and seamlessly. and its so calm and soothing now. guess the paint colors would have to be my favorite thing…and I love that you painted the lower cabinets in the kitchen. very hip. Gorgeous transformation, Kristie. I love the furniture in the living room. I actually have that credenza in its original mahogany color. It’s in great condition, with a matching curved glass dining hutch. My sister made me swear not to paint them, because my grandfather bought in 1952 from the Spiegel catalog. You absolutely knocked it out of the park! I love everything you did. You and Allison have been working very hard and it looks amazing. Great job!! My favorite is the new color palette. Love your posts. What is not to like! It is beautiful and livable. 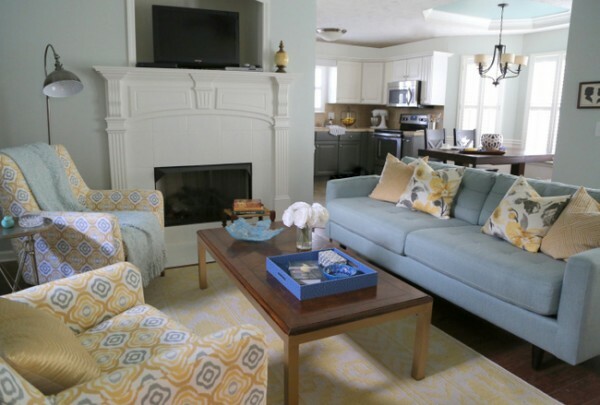 I love the colors, the sofa, the blue cabinet in the foyer and the furniture arrangement. You are amazing, Kristie! 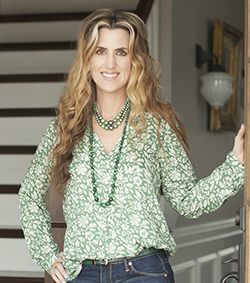 I love everything – the colors, how it all flows together and the furniture is beautiful. The couch placement really does make a difference with the two rooms coming together! I absolutely love this!!! Kudos to both of you. My favorite part is how you took what you had and you made it look completely different. Often times, I want to get rid of flooring, tear down walls, add new windows, the list goes on and on and on but I need to think a little simpler. What you did looks simply gorgeous. Great job! Where do I start? I like everything… You have the magic touch, I am sure Allison and her family are very happy. What I love the best is friends using their gifts to help each other…and that I know BOTH of you! Simple, eloquence!!!!! Kristie, you work is just STELLAR!!!!!!! I can’t help myself and keep coming back to this post!!!!!! I love the inviting look, the clean, crisp feeling and am in love with the colors!!!! I want my living room to have this same fresh, inviting feeling!!!! 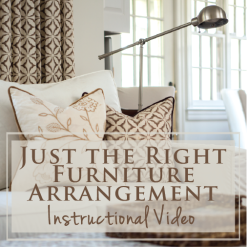 I love your video on placement of furniture but have yet to watch the one on painting. Thank you for your Amazing work and wishing you and all your viewers to this post a Very Happy Mother’s Day!!!!! The space looks 100% better! Glad to see the red and yellow gone–yikes! 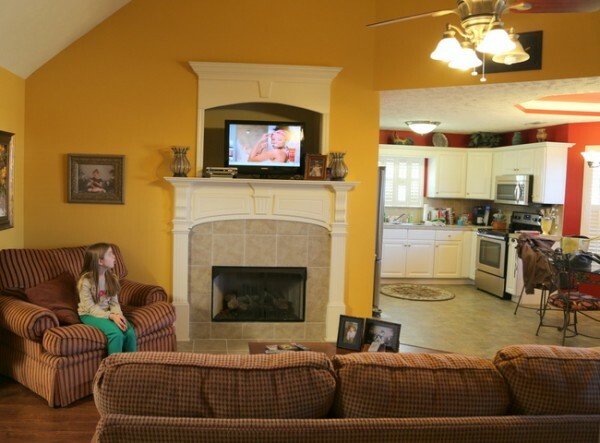 The living room space is laid out nicely for conversation, but how does one watch the TV that’s above the fireplace? Turning your head sideways for any length of time is, well….a pain in the neck! Wow! This is so beautiful! Approximately how much did it cost to do all of this? Did she hire people to paint or did she do it herself?